Another mysterious wave of dead sea animals has washed ashore in Peru, the possible consequence of ongoing radiation releases from the Fukushima Daiichi nuclear facility in Japan. BBC News reports that 500 dead sea lions were recently discovered on Peru's northern coastline, some 250 miles north of the capital city of Lima, with no obvious explanation as to why this occurred. The latest of several mass die-offs in recent years, the rotting corpses were found on Anconcillo Beach, located in Peru's Ancash region. Both young and old sea lions were found at the site, which the local governor blamed on fishermen who may have poisoned them while they searched for food at the shoreline. Others like the environmental group Orca, however, say oil exploration is probably the cause. As investigations continue, a definitive cause of the deaths has yet to be determined. The Maritime Institute (Imarpe), in a government report, denied that oil exploration had anything to do with the deaths. Meanwhile, Peruvian police are reportedly looking into other possible causes of the deaths, including entanglement in fishing nets or the accidental ingestion of plastic. But another possible cause that is deliberately being ignored is radiation poisoning from Fukushima, which continues to be a problem in some areas of the Pacific Ocean. Radioactive plumes are still traveling eastward across the Pacific, affecting everything in their path. Nuclear expert Arnie Gunderson, during a recent episode of Radio Ecoshock, warned that the worst is still yet to come from Fukushima. He reiterated this warning during a subsequent airing of the Nuclear Hotseat show, emphasizing that both soil and groundwater are threatened by these radioactive plumes, which will continue to cause problems for many decades. "We are not at the peak," he stated, noting that two radioactive plumes are currently traveling up and down the West Coast, one near Canada and the other near Oregon and California. "It's still coming, and it will continue to come as long as Fukushima continues to bleed into the Pacific." 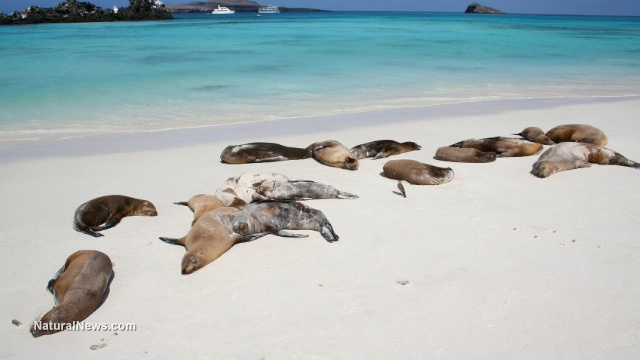 Several months prior to this latest sea lion discovery, at least 200 other sea lions were found dead even further north in the Piura region of Peru. Several dead dolphins and sea turtles, as well as dozens of pelicans, were also strewn among the mysterious marine wreckage, which also went unexplained by authorities. And back in 2012, just one year after Fukushima, hundreds of dead dolphins were found along another beach in Peru, also without explanation. Each of these events is still technically under investigation, though any consideration of Fukushima is apparently off the table as government authorities attempt to blame other less likely factors. "[Fukushima is] going to bleed for decades, if not centuries [into the Pacific]," added Gunderson during one of his radio segments. "There will still be a huge residual amount of radiation in the soil and in the groundwater so that the site will continue to bleed into the Pacific a century or more."